Here are 3 stories of childhood trauma overcome in the last year. I haven't properly had a bike of my own in a number of years. When I was a wee lad, I was mildly traumatised by falling off my bike when taking a turn with a handful of Oreos. I consequently neither biked nor ate Oreos for a number of years. Later on, I would borrow my sister's bike that I had grown in to. Tragically, I left it outside one winter and, yes... Later, I would come to borrow a landlady's bike at a co-op job in Vancouver until a car drove in to me at an intersection (I had the right of way; I wasn't hurt, just traumatised). 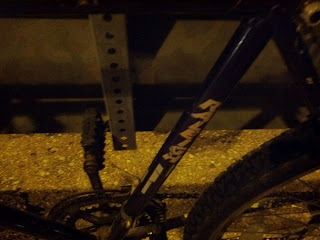 While in New Zealand, I finally acquired a new bike, a cute purple thing from K-Mart (yes, they exist there), but it was more for a friend anyway, though I'm not sure they recognised that. I couldn't really contemplate riding it myself much, as the roads didn't feel safe there to me, especially given Vancouver. However, back in Guelph, there are many new bike lanes. I sort of wanted a bike last August while I started exploring my life backwards, but I thought winter was coming too soon. Ultimately, winter never really came and I missed many excellent months of cycling This summer, finances were too irregular to do much, but yes! Two days ago, I finally visited the amazing bike shop Backpeddling on Crimea by the train tracks and have acquired myself a used purple-and-white Raleigh! My calves are a little stiff from all the cycling I've done in the last two days. I've probably cycled more in the last two days than I have in the last 6 years. I also now get to cycle around Guelph with friends which I've been eagre to do, and had fun with my friend Krystabel taking secret roads through beautiful portions of Guelph. After that, I never wanted to swim. I was forced to take swimming lessons in a public pool in a nearby town, Shelburne, but I refused to actually swim without a flotation device. Finally, when I was like 10, we were on Manitoulin Island, and there was a pool, and my sister was swimming, and I finally hopped in and swam a lap. Close to the edge. Always with safety within grasp. However, at some point before or after that I was on a tube raft in the local pond and it started drifting near a small waterfall and I couldn't get away! I got closer and closer and was petrified! I didn't want to drop my frail body 10 feet onto the rocks below! My gallant sister swam hardily after me and dragged me back to shore. It was mildly traumatising. Finally, years later, more encouragement. In 2007, perhaps, I was with a friend at the Flesherton pond and I wanted to be a complete human being around her and I felt safe around her, so I swam, damn it, I swam. It was in water that I could still touch the ground in, but I forced my muscles to drive me through the water and my brain to hold back my consuming anxieties, and I did not immediately drown. This helped me later when kayaking and canoeing, when my stress would increase greatly due to going out quite far (despite having a life jacket) but at least I could go out there and enjoy the water. It did not help me while in New Zealand when faced with strong waves on the beaches of St. Kilda and St. Clair, though. So, this past Labour day weekend, I went camping with some friends at Grundy Lake Provincial Park and put my strength and maturity to the test by forcing myself to try to swim to a dock. 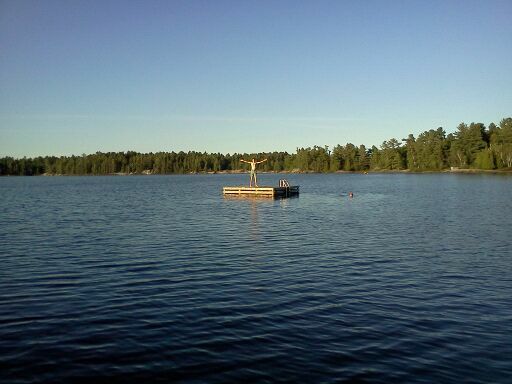 I have never swam out to a dock before! They are always in deep water, and I would surely drown! But Lo! 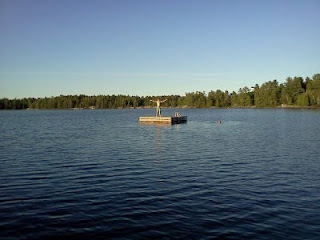 It's me, ON A DOCK! In truth, my anxieties were almost overwhelming as I approached the dock, and realised I'd have to modify my movements to be able to climb on to it. It was near panic. But I did it twice! I had a strong swimming friend, Shane, available if it looked like I was going to start drowning. These two accomplishments sort of go along with my winter one of skating. I fell down on ice one too many times when I was young and then refused to try skating again (despite dreams of becoming a hockey player). In 2006, friends wanted to go to Nathan Phillips Square in Toronto for skating. I got as far as going onto a bus, but when once there someone suggested not doing it because of how completely full it was, I readily agreed. In 2008 in Vancouver, I first became interested in really learning how, but to be honest, anxieties limited the extent of my efforts to learn and I don't think I even made it to a skating rink, which was unfortunate, as I really wanted to, but at the time I didn't know how to effectively handle stressful anxieties like that. This past year, though, I finally made it to Nathan Phillips Square, with friends from OCUS, where one friend in particular, Rachel, helped me finally learn how to balance and move on ice. It was amazing. I went on to buy my own used pair of skates from Bibles and Missions (a thrift store in the Guelph Eggcetera plaza, next to Lens Mills Store) and skate a number of times in Guelph's new outdoor water pad/skating rink outside of city hall with a variety of friends, even celebrating my birthday on the ice with my friend Ariel. I don't want silly things to prevent me from living life with my friends.